Girl Scout cookies are delivered every spring in Utah. We love their delicious thin mint cookies! We decided to give these No Bake Thin Mint Cookies a try. Oh my goodness!!! They are so easy to make and taste amazing. Now we can enjoy the delicious taste of girl scout cookies all year round! And the best part is that they are no bake. These no bake cookies are so easy to make and taste just like girl scout thin mint cookies! In fact, I think they taste even better! Cover 2 cookie sheets with waxed paper and set aside. In a microwave safe bowl melt the milk chocolate chips and the semi sweet chocolate chips for about 1 minute. Stir and then return to microwave and heat at 30 second intervals until completely melted and smooth. 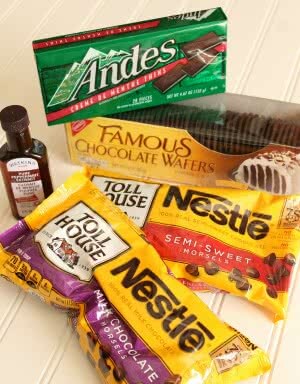 Add the Andes mints and stir into the hot melted chocolate chips and stir in by hand until they are melted in and smooth. Then stir in the peppermint extract. Place on the waxed paper and let set up. You can refrigerate for quicker set up. Combine the very soft butter and powdered sugar until well blended. Then add in the milk, food coloring and peppermint extract. Mix until smooth. If it's too runny add more powdered sugar. If too thick add a little bit of milk. Put into a plastic bag and trim off the corner. Pipe over each cookie. Quick and easy ingredients are all you need! Wow these look and I imagine taste even way better than the girl scout cookies. Will definitely be giving these a try asap. Thanks for sharing this recipe. Hugs! I';m a long time fan of your blog and newsletter. I was hoping you would start doing some of the great Giveaway's like the other bloggers do. I'd love to win some Kitchen items! 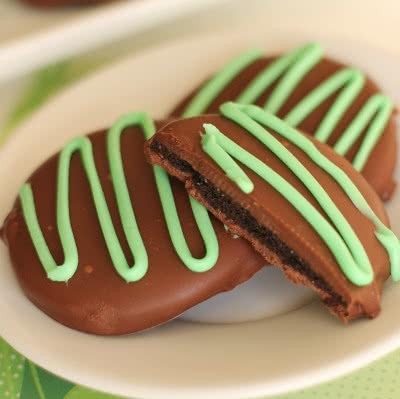 The no bake thin mint cookies are delicious!? If I were judging this recipe I would give it a medal! ?I just love them!? ?